In a Pew Research Center survey conducted three weeks before Obama’s speech, 71% of Americans rated the economy “poor,” and 80% said jobs were difficult to find. Little surprise, then, that 85% of Americans around that time said strengthening the nation’s economy should be a top priority for the new president and Congress, and 82% said improving the job situation should be a top priority. As it turned out, the U.S. economy began to recover that summer, although growth has been modest at best and the middle class hasn’t seen much benefit. The unemployment rate, which peaked at 10% in October 2009, stood at 5% last month, its lowest level in nearly eight years. However, millions of Americans have left the labor force entirely, due to retirement, disability, despair at finding work or other reasons. The employment-to-population ratio, which was 60.6% in January 2009, bottomed out at 58.2% in the summer of 2011, and had recovered only to 59.5% by last month. Public attitudes about the economy and job situation have improved since Obama’s first speech to Congress. In a Pew Research Center poll conducted last month, 27% rated economic conditions excellent or good, compared with just 4% in the February 2009 poll. While 53% still say jobs are difficult to find (versus 41% who say jobs are plentiful), that split is similar to where the public’s views stood just before the Great Recession. Seven years ago, concern over the deteriorating economy displaced what had been the public’s top priority for several years running, defending the country against terrorism. But terrorism was still the third-most frequently cited top priority, with 76% of Americans in the January 2009 poll citing it as such. While there haven’t been any incidents of terrorism on the scale of the Sept. 11 attacks, there have been several significant ones, such as the Fort Hood shootings in November 2009 (in which 13 people were killed and 30 were injured), the April 2013 Boston Marathon bombing (three killed and an estimated 264 injured) and last month’s shootings in San Bernardino (14 killed, not counting the two shooters, and 23 injured). And terrorists have launched several major attacks overseas, such as the series of coordinated attacks in Paris this past November. For most of Obama’s term, the public gave him fairly high marks on his handling of the threat of terrorism – peaking in May 2011, just after the killing of Osama bin Laden. But Obama’s approval ratings on handling terrorism have fallen since, and took an especially precipitous drop after the Paris and San Bernardino attacks. Whatever one’s feelings about the health care-reform measure, more Americans are covered by some form of health insurance now – whether employer-provided, purchased on an exchange or obtained via Medicaid or Medicare – than when Obama took office. According to the Census Bureau, 16.1% of Americans (nearly 49 million) were uninsured in 2009; by 2014, the last year for which there are data, only 10.4% (almost 33 million) Americans lacked health coverage. In 2009, 61% of Americans rated “improving the educational system” as a top priority, the fifth-highest rating among the 20 issue areas asked about. Obama in his 2009 speech also stressed the need to improve education in the U.S. – in his words, “to ensure that every child has access to a complete and competitive education, from the day they are born to the day they begin a career.” Along with supporting reforms at the elementary and secondary levels, Obama emphasized the importance of more Americans getting educated beyond high school, either at college or in career training. The share of Americans ages 18 and older with at least some education beyond high school has risen since 2009, according to the Census Bureau – from 55% that year to 58% in 2014 – though that’s a continuation of a trend that dates back to at least 2001. But student performance at the elementary and secondary levels hasn’t changed much, according to data from the National Assessment of Educational Progress. 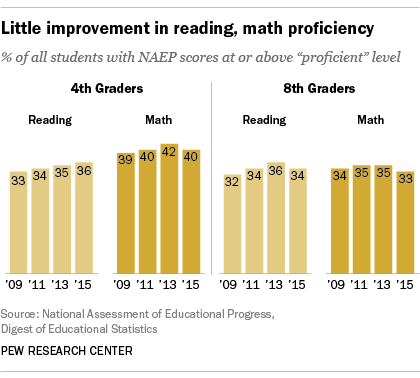 The share of eighth-graders scoring at or above the “proficient” level in reading went from 32% in 2009 to 34% in 2015, for instance, and the share scoring at or above proficiency in math went from 34% in 2009 to 33% last year. Among fourth-graders, 36% scored at or above the proficiency level in reading last year, versus 33% in 2009. For math proficiency, the shares were 40% and 39%, respectively.